Although winter is just around the corner, some mornings we just crave something cold, sweet and packed with nutrients- a Smoothie Bowl is perfect! To fight off free-radicals and everyday pollution as well as improve our immunity in the colder winter months, antioxidant-packed smoothie bowls are a great idea for anyone trying to switch up their daily breakfast. This smoothie is packed with Vitamin C from the Goji Berries and Fibre from Chia Seeds. It also has some energy boosting properties which come from the Maca Powder, so it is definitely a great choice for starting your day off! In the summer this is also a great choice for a healthy ice-cream alternative! Place the frozen berries, Maca Powder, Chia Seeds and Water in a fast-speed blender and blend for 1-2 minutes or until smooth. 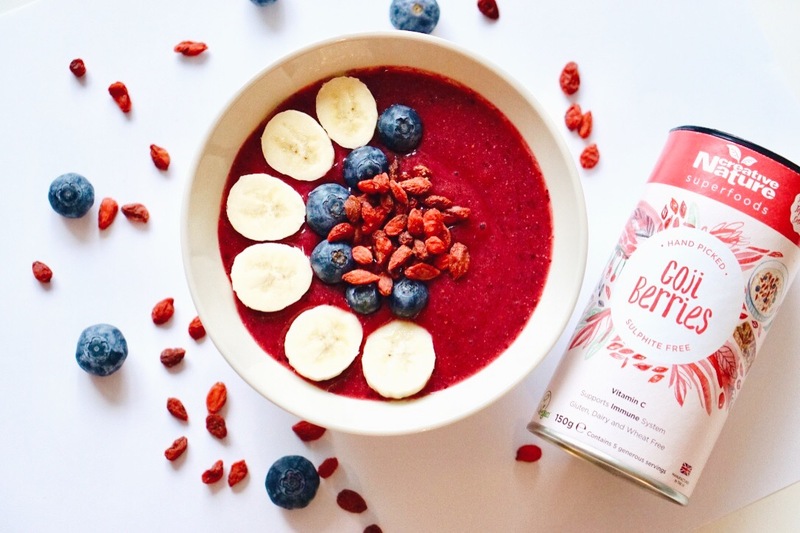 Pour the smoothie into a bowl and top with Creative Nature Goji Berries, Bananas and a mixture of berries or fruit of your choice!